This is a very welcome collection of four new short stories from the much missed author of exceptional psychological crime mysteries. Val McDermid’s introduction commends James for taking us to places that are “dark, vicious and shocking. But always beautifully written”. My favourite is the deeply menacing and highly believable A Very Commonplace Murder, which reminded me of a Shirley Jackson short story in its precise and convincing suburban horror. A man asks for a key to view a rental flat, and the house agent suspects he is not genuinely interested in renting it. The agent is right. “It was the first time he had been back since it all happened sixteen years ago. He came neither as a pilgrim nor a penitent. He had returned under some compulsion which he hadn’t even bothered to analyse”. And so we are compelled to find out what happened in this flat, and what this man’s relationship to it was. I was glad to meet favourite detective Adam Dalgleish again in The Twelve Clues of Christmas. 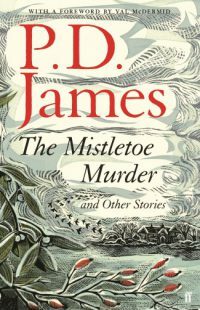 In a lovely small hardback edition, this is great gift for fans of crime fiction, especially those who thought we’d never have another new thing from P D James to savour. If you’re buying one Christmas crime book this year, make it this one.